The true story behind this movie is remarkable: the tale of one family's experience of the 2004 tsunami in south Asia. Many survivors of the tsunami have said how true-to-life the movie is. But beyond the story is equally remarkable filmmaking. J. A. Bayona directs with great finesse. The scenes before the tsunami are some of the most suspenseful I've ever seen because you know what's coming and Bayona uses sound and blackouts to create a sense of dread, even as the family is enjoying itself and sky is clear. Sudden noises in traffic. Turbulence on the plane. A view looking out at the placid ocean that cuts to black. We sense something underneath the surface that is threatening, and who knows which of these moments represents the one in which the earthquake, deep in the sea, actually occurred, setting this enormous tragedy in motion as tourists sunbathed and locals went about their day. 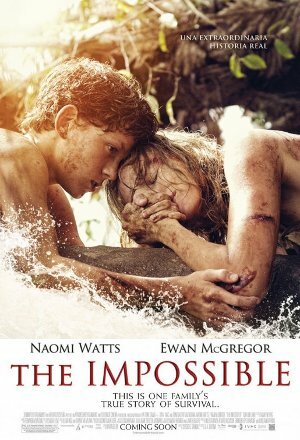 I expected the movie to be more about the main character, Maria (played by Naomi Watts), clinging to a tree for hours (which she did), in other words a chronicle of a single feat of endurance like 147 Hours. But the movie covered much more than just that awful time. It's the time before, the time during, and the time after, showing how the characters' endurance and consciences were tested for not just a few hours but for days, in complex, varied ways. The filmmaker packs so much into this movie: what it means to love, how humans operate in tragedy, what family means, the difficulty of making decisions with children when no decision is good. My favorite scene was when Maria and her oldest son, Lucas, have dragged themselves near a tree they think they can climb and be safe in case another wave hits. As they near it, absolutely exhausted and seriously hurt, they hear a child's cry. Maria starts to look for the child while Lucas begs her not to, to instead get to the tree and safety. "We're going to die!" Maria bends down to him, puts her hands on his face, and says, "If it's the last thing we do." And they go to find the boy.